On Saturday, July 25th, the Bartley Corporation proudly accepted the 2015 CFA Project of the year award (Concrete Foundation Association)!! 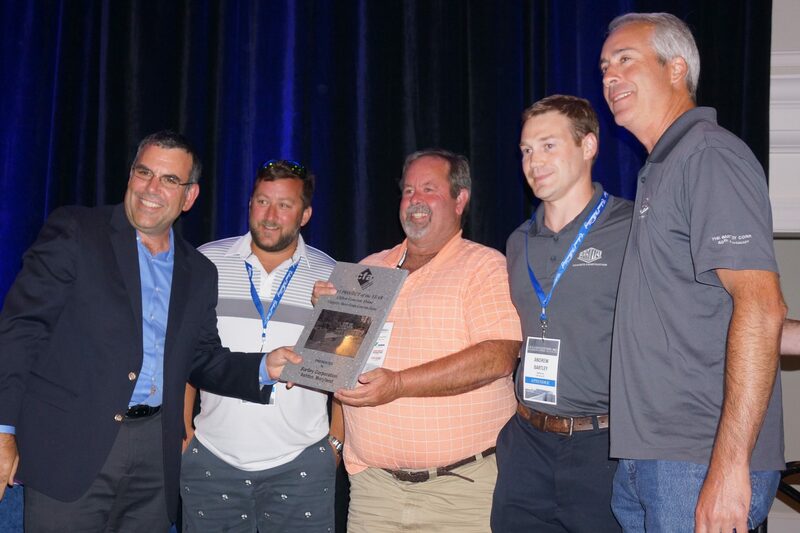 Jim Baty of the CFA presented the plaque to four Bartley Corp leaders during the 2015 CFA Convention in Williamsburg Virginia. If you didn’t know, this is kind of a big deal !! The CFA Project of the Year is an annual national competition seeking to recognize the best concrete projects. The recognition made its way into several national publications including the June 2015 Concrete Facts magazine and the 2015 July Concrete International magazine. For the complete press release, click here: CFA-Project of the Year 2015 Winner. 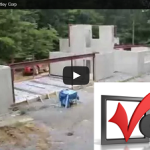 Bartley Corporation thanks all those who support the project with their votes. A special thank you also goes to the fantastic Bartley Corp customers and all of the dedicated employees that helped create this award winning work. 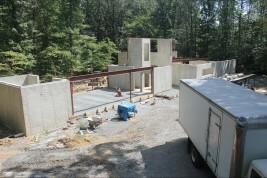 You can read more about the entire project on the Clifton Concrete Home project BLOG. 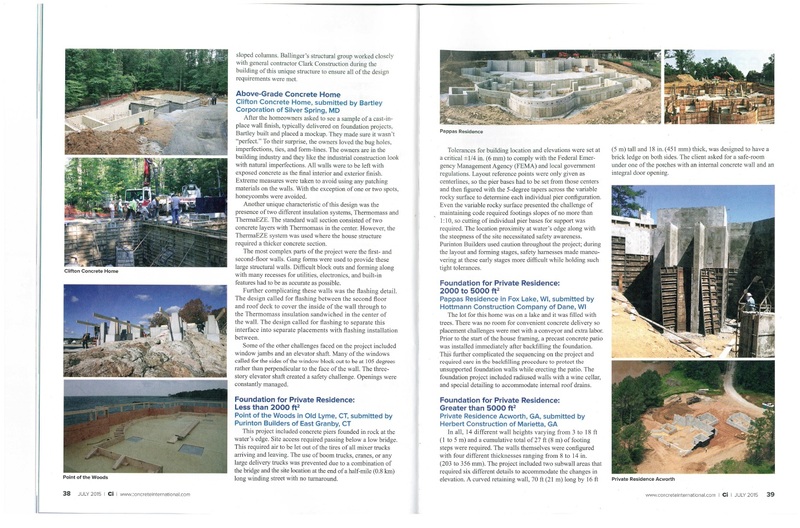 Since the start of the new millennia, the recognition of performance and aesthetic advantage for all concrete homes has been a focus for the CFA and many throughout the concrete industry. Over the years, many fine works of construction and design have been recognized in this award category. 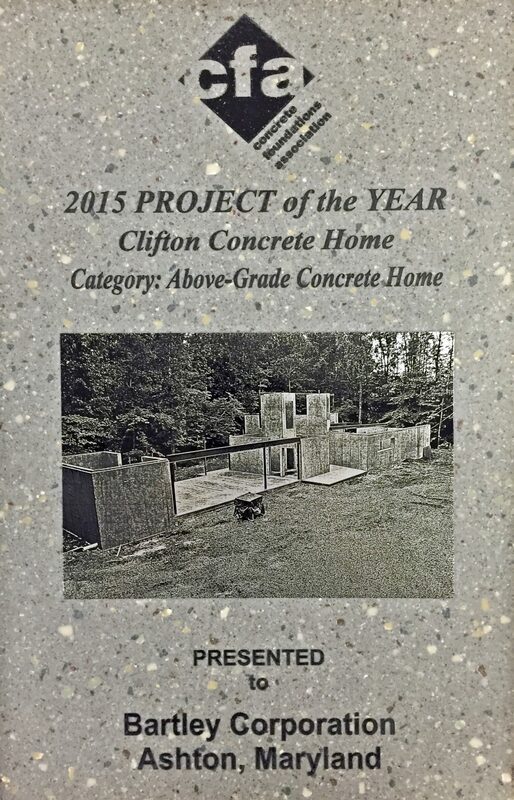 Certainly not less impressive is this year’s “Above-Grade Concrete Home Project of the Year,” Clifton Concrete Home by Bartley Corporation. 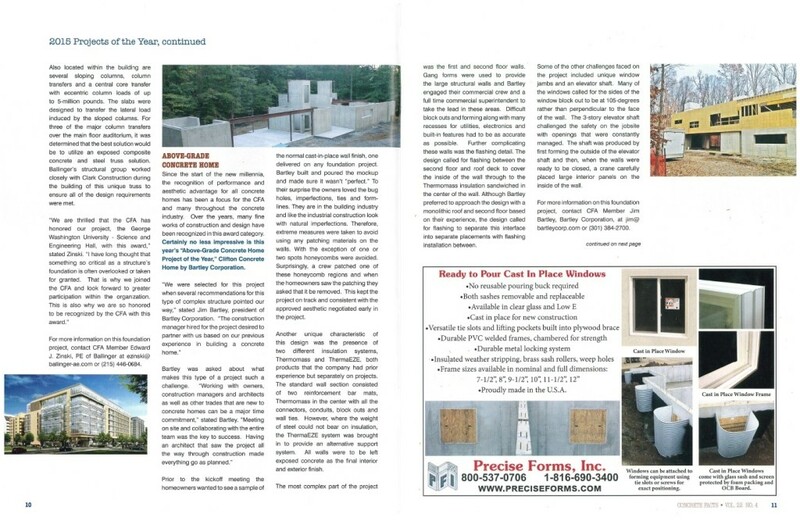 Prior to the kickoff meeting the homeowners wanted to see a sample of the normal cast-in-place wall finish, one delivered on any foundation project. Bartley built and poured the mockup and made sure it wasn’t “perfect.” To their surprise the owners loved the bug holes, imperfections, ties and form- lines. 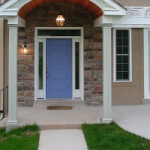 They are in the building industry and like the industrial construction look with natural imperfections. Therefore, extreme measures were taken to avoid using any patching materials on the walls. With the exception of one or two spots honeycombs were avoided. Surprisingly, a crew patched one of these honeycomb regions and when the homeowners saw the patching they asked that it be removed. This kept the project on track and consistent with the approved aesthetic negotiated early in the project. Another unique characteristic of this design was the presence of two different insulation systems, Thermomass and ThermaEZE, both products that the company had prior experience but separately on projects. The standard wall section consisted of two reinforcement bar mats, Thermomass in the center with all the connectors, conduits, block outs and wall ties. However, where the weight of steel could not bear on insulation, the ThermaEZE system was brought in to provide an alternative support system. 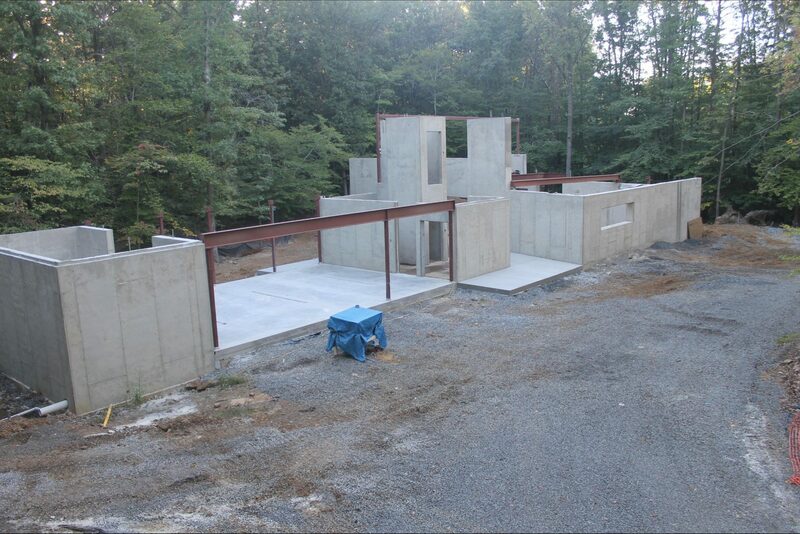 All walls were to be left exposed concrete as the final interior and exterior finish. 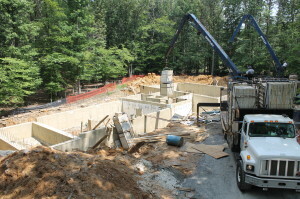 The most complex part of the project was the first and second floor walls. Gang forms were used to provide the large structural walls and Bartley engaged their commercial crew and a full time commercial superintendent to take the lead in these areas. Difficult block outs and forming along with many recesses for utilities, electronics and built-in features had to be as accurate as possible. Further complicating these walls was the flashing detail. The design called for flashing between the second floor and roof deck to cover the inside of the wall through to the Thermomass insulation sandwiched in the center of the wall. Although Bartley preferred to approach the design with a monolithic roof and second floor based on their experience, the design called for flashing to separate this interface into separate placements with flashing installation between. Some of the other challen ges faced on the project included unique window jambs and an elevator shaft. Many of the windows called for the sides of the window block out to be at 105-degrees rather than perpendicular to the face of the wall. The 3-story elevator shaft challenged the safety on the jobsite with openings that were constantly managed. The shaft was produced by first forming the outside of the elevator shaft and then, when the walls were ready to be closed, a crane carefully placed large interior panels on the inside of the wall. For more information on this foundation project, contact CFA Member Jim Bartley, Bartley Corporation, at jim@bartleycorp.com or (301) 384-2700. Your VOTE = National Project Win? !